How will you use the new Jefferson County digital courtrooms? Louisville (Jefferson County) Courtrooms Are At The Forefront Of Audio/Visual Technology. Our Louisville court reporters are always monitoring the changes in our industry and this is one that will change your deposition practice. The Jefferson Courtroom Upgrade Project (JCUP) has completed the installation of an all-digital multi-input, triple-screen output audio/video system in Divisions 1 and 8 of the Jefferson County Circuit Court. The new digital systems feature dual-projection screens with high definition projectors and a 55-inch LCD monitor which allows trial counsel to display three different images simultaneously. The new system is controlled by an iPad that is dedicated to each courtroom. 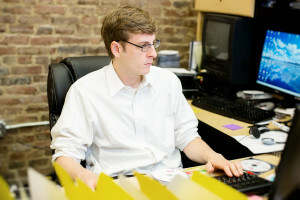 A trial lawyer or support staff routes the input by selecting the picture of their counsel table, the connection into which they have plugged the computer, and the screen to which they want to route the output. 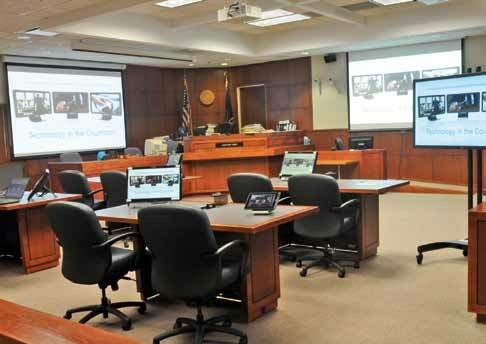 Having invested nearly One Million Dollars in the new technology, the Circuit Court is clearly committed to making cutting-edge trial presentation technology a permanent part of the courtroom. Are You Prepared For Trials In The 21st Century? Many attorneys have expressed some concern about being able to operate the new audio/visual systems in the new courtrooms. However, the system is designed for ease of use and can be operated from a simple iPad. In addition, the Louisville Bar Association is providing training for the new system so that every attorney in Jefferson County will be able to easily operate the trial presentation equipment. The real concern for attorneys should not be whether or not they can operate the courtrooms’ presentation technology. Instead, every attorney’s focus should be on how they are going to use the technology to better their case. JCUP Without Video Is Like An Xbox Without Any Video Games. Assuming you have mastered all of the new courtroom presentation equipment, the only question remaining is what are you going to do with it? You have to be able to show the jury something on those brand-new high definition projection screens. No kid wants an Xbox that does not come with games. Likewise, a jury does not want to see a blank screen or simple blow-ups of a deposition transcript. The whole point of the new presentation system is to be able to cue a jury through text, audio and visual means. Quite simply, you need to make sure that you have video of all pretrial testimony. Video Testimony Is More Persuasive To The Jury And The Judge. It seems like it is safe to say that video is a more persuasive means of convincing a jury than simply reading a deposition transcript. After all, there is a reason that television commercials cost many times more than radio commercials – they are more persuasive. That said, no one should think that video depositions are only for use at trial. They are just as valuable when arguing motions to judges. After all, it has been the judiciary leading the charge for courtroom upgrades. Clearly, the judges want to see more testimony. Playing snippets of video depositions during your motion practice will add considerable authority to the deposition testimony by providing context and showing the judge the witness’ body language. Verbal argument before a judge can turn into a boring monologue. The key way to break up your argument is by inserting video testimony rather than monotonously reading from the record. When the judge can see and hear the combativeness of a witness (or counsel), he may grant an entirely different ruling on your motion to compel than he would have by only reading a transcript. Louisville Video Depositions Are Affordable. Our videographers provide professional video deposition services at reasonable rates. We charge $85 per hour for the first hour and $65 for each additional hour. The fact that we advertise our rates (our competitors do not) demonstrates how reasonable we are. In fact, video rates can often cost less than traditional court reporting rates. If you do need a transcript at a later date, we can affordably transcribe the video record. We have a full-time video editing specialist in-house. Our cost includes the production of objection logs, exhibit logs, multiple video formats and preservation of the video record in perpetuity. We will also edit your video for trial at no additional charge. Again, we can provide these services at such a reasonable rate because we have in-house video-editing staff who specialize in video depositions. Kentuckiana Reporters Is The Premier Provider of Louisville Video Depositions. We are one of the few court reporting companies in Kentucky to maintain a staff of in-house videographers. We routinely take three and four video depositions each day (sometimes as many as nine or ten). We have seen the percentage of attorneys adding video to their depositions increase from about 20% of all depositions to closer to 40% of all depositions. We strongly believe that this trend will continue as more attorneys use the new digital courtrooms. Attorneys perform better at video depositions because they prepare more and are more focused on efficiency. The camera captures the emotions, the fidgeting, the delays and the comfort levels displayed by the deponent. In many cases, video is simply a better record and it is now cost efficient. Our advice: videotape all of your depositions and do not try to do it yourself. The Louisville courtroom upgrades are designed to immerse jurors in visual images. Without a video record, there is not much to show the jurors on those beautiful new screens. Our court reporters and videographers work together to produce a video that is synchronized to the text of the deposition transcript. You do not need to rush out and buy video production software, trial presentation software or synchronization equipment – we already have it. Moreover, we have established an expertise by using these technologies daily. Our full time production staff carefully syncs the video to the text. They also conveniently scan all of your exhibits into digital files and attach them to one DVD. In short, our staff will completely digitize your deposition and provide you with the tools you need to maximize the impact of the courtroom upgrades. We then carefully label all DVDs to indicate whether they have been edited for trial. The bold red print tells you not to pop this disc into the new trial presentation equipment. You can easily see, from looking at the above picture, this particular DVD is “NOT EDITED FOR TRIAL”. 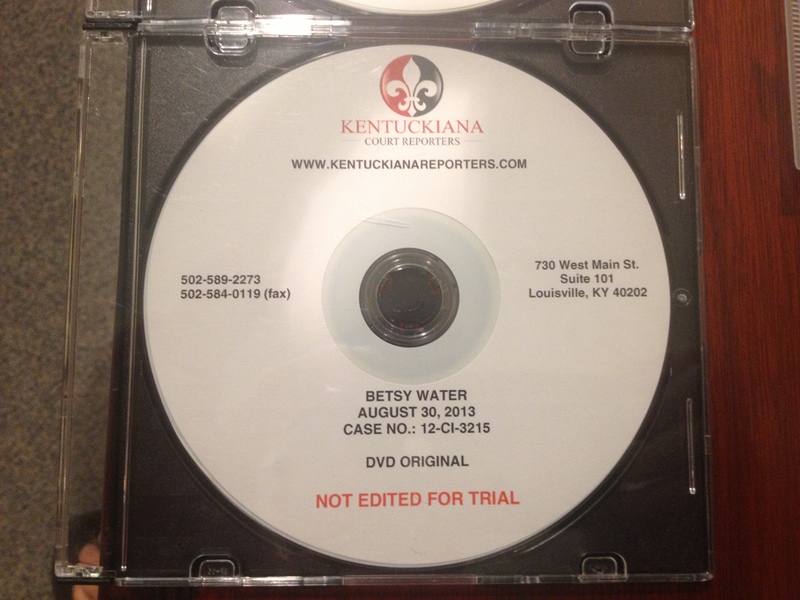 We label all of our DVDs because attorneys ask a lot of questions during a deposition that are not admissible at trial. For example, if an attorney asks a defendant if they have insurance and then plays that testimony at trial, a mistrial is likely. We prevent mistrial by providing you with a warning label and a time-stamped log of all the objections made during a deposition. This makes it very easy to go back to the unedited DVD and remove all objectionable material as is your obligation under Rule 98 of the Kentucky Rules of Civil Procedure. 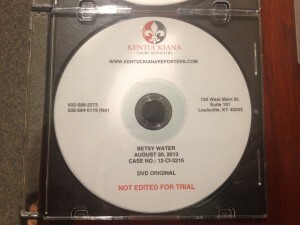 Best of all, we will edit your DVDs for free and then label them as “TRIAL READY.” In other words, we take the worry out of trial presentation by doing the prep-work at the time the deposition is taken. When you walk out of a deposition taken by Kentuckiana Court Reporters, you will know that you have an accurate video, audio and written record that is completely compatible with JCUP. You will also have the peace of mind that comes with knowing that you have our entire staff at your disposal to edit, copy, download, print and organize your data. Of course, we also offer trial presentation services with TrialDirector and Sanction.